It’s only a couple weeks away from the third annual edition of the Trans Am Bike Race, which is pretty hard to believe because I have not even completed all my intended blog posts after finishing the race in 8th place in 2015. Here’s one of them: a compilation of some of the questions I have gotten since then. Hopefully, the following will help some of the cyclists who will be doing the race this year. I have used turn by turn cue sheets to get me through most of my rides. It sounds like you used GPS but then ended up having to use the adventure cycling maps after an electronics failure. Do you recommend using a gps or do you think a custom made turn by turn cue sheet will work ok? If you aren’t as directionally challenged as I am, turn-by-turn cue sheets probably are fine. The vast majority of the route is not too tricky to navigate. Using cue sheets only would reduce some complexity, namely not having to charge the GPS unit every day and not being prone to failure. That said, if you are not paying attention and you get even lost one time, think of how much time you can lose by having to backtrack. A GPS unit can notify you within 10 seconds of getting off course. It can also notify you to turn in the dark when it’s hard to see road signs. Another benefit is being able to record what you rode every day after you are done with the ride and want to write about it. I had a pretty good system rigged up using a Motorola Moto E cell phone and using the RideWithGPS app. I would keep the screen off and keep the phone in airplane mode 99% of the time. After a full day’s (usually 20 hours) worth of usage, I would still have about 60% battery left. I feel pretty idiotic for allowing it to die in a rainstorm. 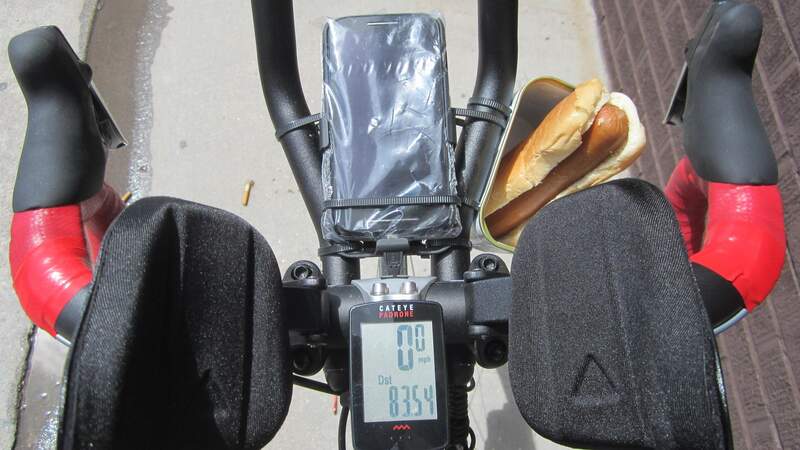 I had covered it in a plastic sandwich bag for the first few days of the ride, but that made it hard to read the screen so I took it off and forgot to cover it again. What I am planning to do for the future is to put the phone in one of those phone armbands and (maybe after some modification) attach that to the aerobars. That will waterproof it while providing screen clarity and touchscreen use. Did you find the Adventure Cycling maps to be especially useful for trip planning, as well as during the ride itself? I haven’t purchased these maps yet but it seems like they are important to have. I personally did not use them in pre-race planning. Basically my plan was, roughly, “to ride 19-21 hours/day for at least 200 miles/day.” But I found them very useful for current-day planning during the race. Like: where can I get supplies next? What will the terrain be like? Where are the next hotels? I made a last-minute decision to carry all my maps and was glad I did. They are expensive, but ultimately I found them critical. There were at least some (I do not know how many) racers who did not buy the maps, but I wonder how they did without them. I would not have wanted to be without mine. Since a mobile phone is also a GPS device and GPS signals are not dependent on carrier coverage, is there a downside to using a phone for all navigation and communications needs? I think a dedicated GPS unit (e.g., Garmin) may be more robust and reliable. The screen may also be easier to read in direct sunlight. But I think a smartphone can be a lot less expensive with much better battery life while having good reliability. I wrote about what phone I used and how much charge it would have at the end of the day in the preceding section. I recharged it every day or two (during the 4-6 hours of sleep I was getting) using an external 5,000 mAh battery pack that had solar cells. There was not enough sun east of Kansas to keep the external battery pack topped up during the day so I needed to charge that in a hotel every few days towards the end of the race. My Moto E’s internal battery was something like 2,000 mAh, so to charge it 40% to top it off each night required only 800 mAh of charge. Check out no-contract cell phones. Lots of good options. You can even activate cell service for a month if you want it as a backup cell phone too! It’s also good to have a backup system. My backup was old-school Cateye cyclometer + paper maps, but if I were to do it again I would have my regular cell phone (with RideWithGPS or CycleTracks app installed) be the backup. It takes a while to prep a device for the TABR course (e.g., it can take hours to download the TABR map file), and I didn’t do that in advance with my regular cell phone… oops. Do you have any guesses on what the true distance of the route is? I keep reading 4400+ miles, which I believe is based on the spot tracker mileage. But Adventure Cycling lists the distance as 4228, which is close to the 4,178 listed for the route you uploaded on ridewithgps. Last year the Adventure Cycling Association listed the distance as 4,233 which I believe is accurate and more so than the uploaded route. I have not figured out where or why the uploaded route was missing miles. That said, the difference is only 1.2%, which is not that much considering that the old-school magnet cycle computers could easily be off by that much. Two years ago I heard that the uploaded route seemed to be 180 miles “too short” which demoralized some riders who were counting on not having to ride quite as far. Definitely count on having to ride the more conservative number. Note that I ended up riding about 4308 miles due to getting lost and intentionally going off course (for supplies), etc. Is the route, as detailed in the maps purchased from adventure cycling, the official one? Or are you provided with an official route link from the race once you register? The ACA route is actually the “official” one. The map I uploaded to RideWithGPS was provided by the organizer with the caveat that it could potentially contain errors. I did not notice any errors when using it, but the total distance is, as noted above, too short compared to the official one. You can now purchase directly from the ACA a digital data set containing track and service waypoint files in GPX format. It costs $42, but may be worth it especially since it contains service information. The less expensive route is to download the latest non-proprietary GPX files from the TABR Resources page for free. They won’t contain service information, however. I’m interested in hearing your thoughts on training needed to complete the race. My goal is similar to the 200 miles/day you were aiming for during the race & so any advice on what kind of additional training you did before the race is appreciated. I’ve been riding throughout the winter as I normally would if I were going to be doing a 1200k this summer. I realize that the 7000km of the race is way, way longer than a 1200k. So I’m trying to figure out how much more training I should realistically try to fit in before mid-May or whether I should look at next year’s race instead. If you are an experienced randonneur or double century devotee, then you are most likely ready for this challenge already. You basically have done all the training you needed to have done in all the years of riding brevets. If you were able to ride thoughout the winter, that is already more than I was able to do. The winter before I rode TABR I was doing an accelerated MBA program and it wasn’t until after I finished in mid-March that I had time to ride again and prepare for the race. Between then and the end of May I did 200-km, 200 mile, and 400-km rides and felt like I was in reasonable shape and even able to be competitive in the race. Of course it depends on what your goals are, but if yours were like mine (which were roughly: 1) finish, 2) average >200 miles/day, and 3) finish in top 20 percentile), I’d say if you can get in four or five 200+ mile rides between the beginning of March and the end of May, you should be all set. Use those rides to test and finalize your gear. I haven’t done a lot of bikepacking, but have experience ditch sleeping on many long brevets. I’ll need to purchase a bike bag or two & a sleeping bag. I’d like to keep gear to a minimum but still be somewhat comfortable. I have an SOL emergency bivy & am researching a 32-40 degree lightweight sleeping bag. Did you find that a bivy, sleeping pad & 32-degree sleeping bag were sufficient for the nights you stealth camped? My 32-degree Mountain Hardware down sleeping bag was overkill and I shipped it home at Newton, KS. I only slept inside it once or twice up to then; the rest of the time on top of it. A lighter, smaller 50-degree bag would be sufficient. REI sells a sleeping bag that packs incredibly small for indoor use and should be fine. You’ll need the sleeping bag in, for example, the Grand Tetons. I used an Outdoor Research bivy (1.1 lbs.) but regretted it. I wish I had taken and used the SOL emergency bivy that my girlfriend had offered me before the race. It would have packed smaller and been warmer and waterproof; note, however, it does not breathe. Most racers used the SOL emergency bivy. Do you have any suggestions on a sleeping bag and/or bike bags? I used a Oveja Negra Gearjammer seat bag. It did the job, but has only a single compartment so don’t count on it for organization. I remember frustratingly trying to fetch new batteries from it at midnight on the side of the road in eastern Kansas while another racer caught and passed me. If I had to do it again, I would use additional frame bags or a bag with more compartments for organization. I did really like my snack box, which I fashioned from a can of SPAM. Is there any other gear you would recommend? I highly recommend this bar-end mirror. It is great to be able to see what’s behind you and I feel this mirror has saved me a few times, not just during the TABR. I highly recommend tubeless tires and sealant. With them, I did not get a single flat tire during the Trans Am Bike Race, and at the time of this writing (May 2016) have not needed to repair a single flat tire along the roadside since getting them (April 2014). I highly recommend using aerobars, not just for speed but for comfort (including taking weight off your hands, possibly reducing the onset of hand numbness). It also can serve as useful attachment points for your gear. Any shifting with a wide range of gears will get you through the race. I used a 50/34 X 11-26 for a range of 34.3-119.4 gear inches, which I thought was low enough except for maybe a few super steep hills in the Ozarks. That said, I am not a fan of SRAM shifters for ultra-distance cycling at all. Here’s why. Powering Electronics: Dynamos, Solar, USB, etc. What did you use for power and lighting? I attempted to use solar/USB rechargeable battery packs to recharge phones, and used a 2-watt Cygolite using 2X AA batteries for the front light. I say “attempted” because east of Kansas, the skies were too cloudy for effective solar recharging. And the Cygolite was not bright enough for fast riding at night and was limiting my speed. If you plan on riding sparingly at night, such a setup can work. It was actually working for me pretty well west of Kansas despite usually biking until midnight and starting at 4 or 5 a.m. If you intend on riding a lot at night, you will need better lights and might want to get a dynamo. Today’s dynamo hubs work with very little drag. Many racers in the 2015 TABR used them. For a taillight, I recommend battery-powered (e.g., using AAA batteries that are available at any convenience store). I had a USB one and somewhat regretted that. It’s much easier to change the batteries once or twice for a rear flashing LED than to have yet another USB item to recharge (and multi-hour charging time). What about locking your bike? Did anyone bring a lock? I actually did pack a small lightweight cable lock, which I used for running errands in Astoria before the race. Otherwise, I ended up shipping the lock back home in Newton, Kansas. My recommendation would be to forego the lock, and to simply bring your bicycle inside whenever you are afraid it might get stolen. I did this inside a Wal-mart and CVS Pharmacy, for example. No employee minded. For small-town convenience stores, just lean your bike on a wall where you can see it through an inside window, and it should be fine. A couple racers did have a lot of electronic gear stolen from them inside a hostel while they were sleeping, however. They had left the gear with their bikes in another room than they were sleeping in. Be careful in such circumstances. Another racer also was robbed at a bicycle campground before the race! Apparently, a shady person came up to him while he was camping and demanded that he handover his phone, battery packs, etc. He then reported this to a ranger who did not even believe him. Fortunately, he had time before the race to replace his stolen goods. See this post for costs. See this post about some of the injuries I experienced and you might. Issues you will likely have without taking strong precautions include sunburn and numb hands. This post describes where I slept during the race, and may give you an idea of where you can get some shut-eye especially when there are no services around. If anyone has any other questions, drop me a line or leave a comment below. Thanks very much for taking the time to post all this valuable info! Outstanding. I am impressed. Congrats on a great ride and sharing these tips with us. Thank you very much for sharing your helpful tips. A did a brevet recently with your BMB riding partner from VT. He had an injury and could do TABR as planned. 1. How bad are the mosquitoes in the Western part from Oregon until say Pueblo? Were you so tired that they did not bother you or how did you handle? I was camping in Colorado in late June last year and they ate me alive but this is a few weeks later in June than TABR would have us getting thru there. 2. How did you hands and/or shoulders heal? You ok now? If you are still suffering, do you have any regrets? Such as, I wish I rode much wider tires? Or, I should have stopped. Hi Ed. Thanks for stopping by my website and for your comment. That’s too bad about Anthony’s injury. 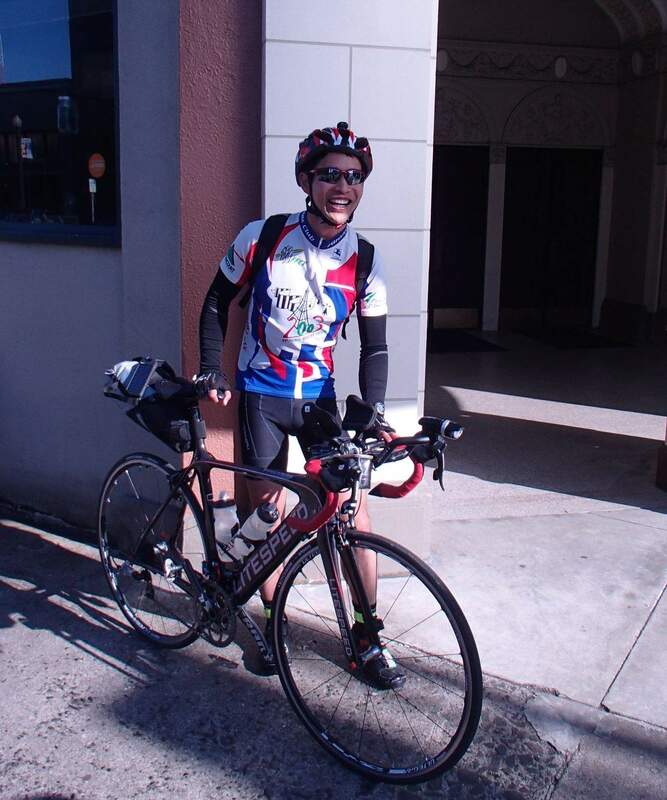 Great job on the brevet you did recently! 1. There was a section near Jackson, Montana where the mosquitoes were really numerous and vicious. (Jackson, Wyoming is another place with vicious mosquitoes.). Unfortunately, I had not packed bug spray and the store there was out of stock due to high demand so I was out of luck. I did buy some bug spray in the next time and there were several nights when I sprayed both myself and my saddle bag with bug spray. I would recommend bringing some. 2. My numb hands healed on their own with no intervention. Well, I tried doing nerve gliding stretches (as prescribed by an occupational therapist specializing in hand injuries whom I visited twice) for the first few weeks and also wore splints, but there was no improvement and I stopped doing those exercises after a few weeks. I ultimately concluded that the nerves just needed time to heal. It ultimately took two months for my right hand and 7.5 months for my left hand to regain all feeling. However, both hands had virtually full functionality after the first month or so, so I stopped worrying about them. After 4 months I was even able to rock climb with no limitations imposed by the numb left hand. I’d even consider building a road bike with front suspension that could be locked out (kind of like Cannondale’s Silk Road bikes from the early 2000s). But I never considered stopping because of the hands as I was fairly confident I was not risking long-term injury and it was more of an inconvenience or strange sensation than, say, dangerous or performance limiting. Shermer’s Neck, on the other hand, was a condition (that I got after 2900 miles) I probably should have considered stopping/quitting for, but was too stubborn or determined by that point! So Felix do I understand correctly that the official TABR route follows the official Trans America Bicycle Trail printed and digital GPX maps currently available on the ACA website? Or is the race route slightly different and you need to have data for both? Thanks very much for the help. Hi Chris! Yep, the official TransAm Bicycle Trail route is the official TABR route. So the ACA’s digital or printed assets are actually the “most” official and also contain the most information. They are also “more official” than the digital GPX files in the Resources section on the TABR’s own website, but the latter are free. Thank you Felix! I just installed the “Ride with GPS” app on my mobile, to see if the ACA maps were available through their catalog. I couldn’t find them, but I did find yours. It’s the first on their list of search results. Do you know if yours matches the ACA map, or if there is a way to install the ACA map into the Ride with GPS app? Sorry for all the questions and truly appreciate all the help. Thank you for sharing some of your experiences. I found them quite interesting. If you are interested, be sure to tune into Reddit tonight (June 8) at 6 P.M. MST for more TABR questions and answers. I’ll be hosting an AMA (Ask Me Anything) session then. Road or mountain bike shoes for Trans Am ? I used and recommend mountain bike shoes, or at least shoes with recessed cleats, for ease of walking. I actually switched from Speedplays that I have been using for 20 years to SPDs just for the Trans Am Bike Race. It was so nice being able to walk normally instead of like a duck with road shoes and do not feel that the slight increase of weight or reduced cornering clearance slowed me down even a tiny bit. I also had no problem with hot spots with my Shimano M065 shoes. When you loaded Ride with GPS on to your phone , did you do it in sections , or the whole route ? I did the whole route. Took several hours to download the route onto the phone! What’s the best way to pay for things on TABR . Card , if so what kind ? . Or other way ? When you downloaded the TABR on your phone from ride with gps , did you download with Cuesheets for turn by turn or just map?